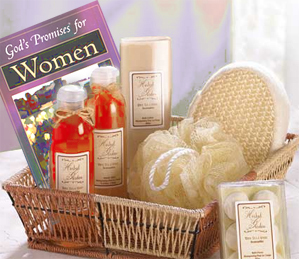 This inspirational gift basket features soothing spa products from the Holy Land including lightly scented body lotion and body wash infused with the aromatic scent of Spikenard Magdalena, the perfume that Mary Magdalene used to anoint Jesus. Also includes practical bath amenities including body sponge and loofah bath mitt. Also features "God's Promises for Women" Gift Book featuring hundreds of topically arranged Scripture verses with inspiring passages on topics including Rejoicing Day and Night, Hope in God's Faithfulness, Having Joy in God, and many more. She's sure to feel God's gentle, loving embrace as she reads these reassuring promises from His Word. Lastly we include a special occasion gift such as an inspirational candle, and Scripture wrapped Strawberry candies.